Boy does proportional representation, the method of voting in Ireland, confuse those unfamiliar with it! It has made elections fascinating occasions, almost akin to a blood sport at times, as seats are fought over fiercely and often won by incredibly thin margins. 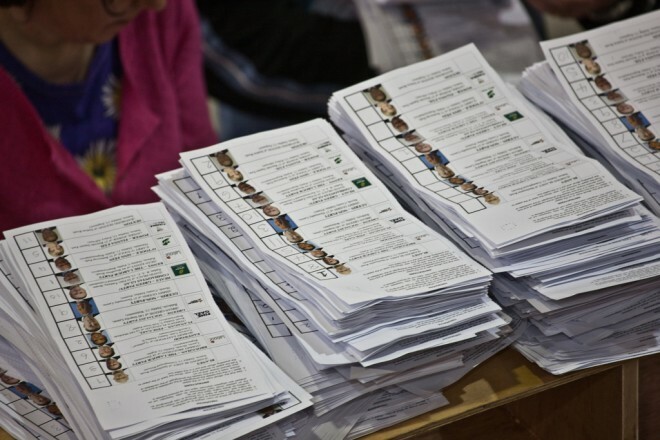 Irish people will talk politics forever and relish a good argument on the subject and there is no doubt that proportional representation gives voters plenty to talk about at election time. Each elects between 3 and 5 candidates depending on population size. Voters choose from a list of candidates and the 3-5 who get the most votes are elected. The larger parties almost always do. This means that the parties are not only competing against each other, but that there is competition between candidates within parties too. This means they vote for candidates in order of preference, giving a number 1 to their favourite, 2 to their next choice, 3 to the next and so on. They are not obliged to vote for more than one person but can if they wish indicate their preferences in numerical order right down a list of 10 or more candidates. To those accustomed to a single seat first past the post system, this seems very complex and, while voting is pretty easy, it is quite complex when it comes to counting the votes! 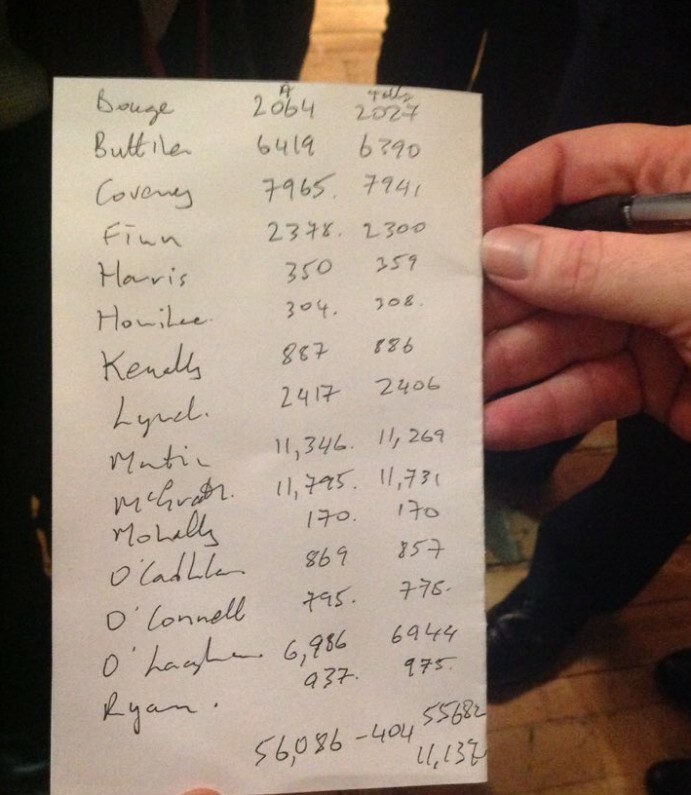 So, let’s take a look at how vote counting works in Irish elections. Once voting is over and all the ballot sheets have been taken to a count centre, the first task is to count the number of valid votes cast in order to set a ‘quota’. This is the number of votes that a candidate will need in order to be elected. In a system with single seat constituencies, the winner is simply the person who gets the most votes; with multi-seat constituencies it is a little different. Instead the total number of valid votes is divided by the number of seats available plus one, and then one vote is added to come up with a quota. Once someone gets more votes than the quota, they are elected. However it is also possible to be elected without ever reaching the quota, as we will see below. Votes are counted not once but several times in a series of counts. These both affect how votes are counted in the second count. Their surplus votes, that is any votes over the quota, are distributed among the remaining candidates according to the voter’s second preference. The surplus votes are chosen at random. For example if a candidate had 800 votes more than required to meet the quota, then 800 voting papers would be chosen at random from their total votes to be redistributed. The candidate with the least number of votes is eliminated and all of their votes are redistributed according to second preferences. The candidate with the lowest number of votes is eliminated, their votes redistributed. This process continues, often though as many as 10 or even more counts, until the required number of candidates has been elected. In the end stages of a count there may be candidates who are elected without reaching a quota. This happens when a point is reached where only two candidates remain and there are no votes left to be redistributed – the candidate with the most votes at this point is deemed elected. While voting in a PR system is in basic terms quite easy – you just number your votes in order of preference – in practice it is a subtle method that allows for a lot of strategy to be used in deciding how to vote. All parties have election strategists who pay close attention to how they can maximise their chances of winning a seat, or for larger parties the chance of winning more than one seat in any constituency. Here are just a few of the strategies commonly employed. Parties with more than one candidate in a constituency will come up with a plan which they hope will result in their getting the highest possible number of seats and ask their followers to adhere to this plan. Quite often they split a constituency geographically. For example, voters in the south of the area may be asked to give their first preference to one candidate while those in the north are asked to favour another. Mostly parties ask that you vote for their candidates, then either stop or carry on any way you wish. However if there has been even a tentative agreement or understanding that two parties may decide to go into a coalition government following the election, they may suggest that voters go for their candidates first, then continue their preferences for the second party. Begging for a preference – any preference! Because an individual vote may be transferred multiple times and count in electing more than one candidate, those canvassing for a party are not deterred when they come upon a voter who declares he will not be giving their candidate a first preference. They will ask (implore) the voter to “Think of him or her anyway” and give at least a lower preference vote. The effect is that every voter matters to every candidate, but particularly to those candidates likely to be fighting it out for the last couple of seats. Just as parties come up with plans, voters have their own favourite strategies for ensuring their vote does exactly what they want it to do. While some simply follow the ‘guidance’ of a particular party, many have evolved their own particular approach to the ballot sheet. These are people who vote for just one candidate and then stop voting and indicate no further preferences. A close relation is the person who votes for just one party’s candidates. Both types of voter are also sometimes referred to as ‘plumpers’. I have no hard figures but such voters are a minority. In general the majority of votes in any redistribution do show lower preferences, even across party lines, as candidates are elected or eliminated. All Irish governments since 1989 have been coalitions, with two or more parties and sometimes a collection of independents coming together to get the required majority. The checks and balances inherent in this arrangement means it is not necessarily an undesirable outcome for the electorate. There are many people who try to vote in a way that they believe gives the best chance to a realistic coalition partnership. This can sometimes mean not giving a high preference to their preferred candidate, perhaps because they believe this candidate will have an excess of votes anyway, and that voting for someone else might help the formation of a strong coalition, or that the candidate is too weak, so their vote would ‘count more’ elsewhere. There is a theory that by voting first for candidates who you believe will be eliminated earlier gives your vote a longer lifespan and a better chance of still being there and involved during the decisive late counts. There is a certain truth in this (provided you’ve called it correctly!) as when a candidate is eliminated, all of his or her votes are redistributed, so you can be sure yours will remain in the pile. When a candidate is elected and a surplus redistributed, it is quite different. Only a random sample of ballot sheets, equal in number to the excess votes over the quota, are redistributed during the subsequent count. While there may be thousands of votes to redistribute, there can equally be just a handful in the surplus, and in either case your actual vote may not pass down to affect later counts. Some situations arise with transfers where it’s hard to comprehend what voters were thinking. There have been occasions where a staunchly right leaning candidate is elected, has a surplus distributed and a good chunk of second preference votes go not to his or her party colleague (as you might expect) but to the most left wing candidate on the list. The passing on of preferences is fascinating to watch, they really do go all over the place at times. This may seem incomprehensible but the local nature of Irish politics is one reason. It is often of great importance to a voter that a candidate lives close to them or went to school with their aunt or attended their father’s funeral. Or voters may be particularly exercised by a local issue – the retention of a hospital that is threatened with closure or the promise of a new road – and vote according to a candidate’s opinion on that issue. Or they may vote randomly or by the candidate’s hair colour or in alphabetical order or by age – sometimes it seems that odd. Bizarre as it may seem, that is really the beauty of proportional representation – you can decide what are the important issues for you, no matter how peripheral they may be or how small a minority you are in, and your vote is just as important as anyone else’s. 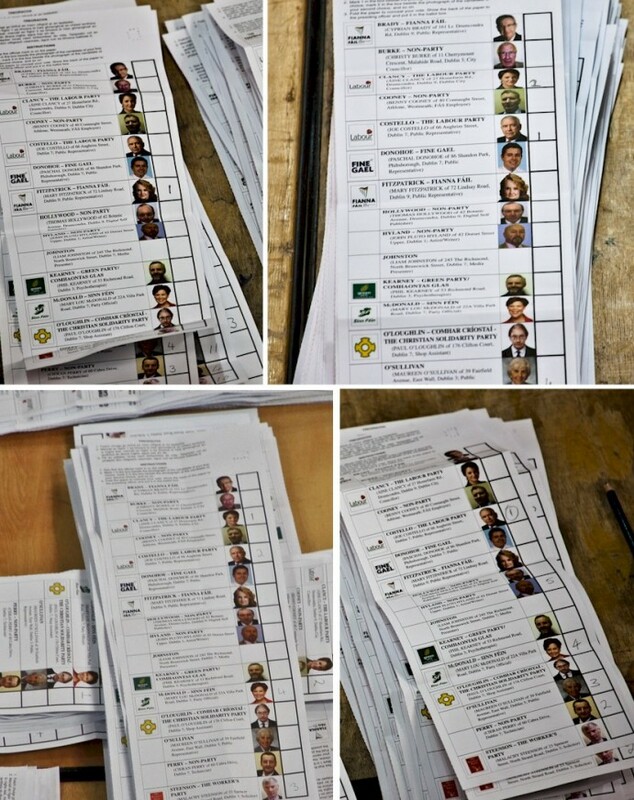 If a voter does not enter numbers beside candidates in a way that clearly indicates their preferences, or writes anything else on their ballot paper, their vote is spoiled and is not counted. It is not unusual for protest voters to use their ballot paper to register their complaint about an issue that is important to them, by writing on the paper and thus spoiling their vote. It may make the voter feel better, but is a fairly futile exercise and those at whom the complaint is directed with probably never see it. 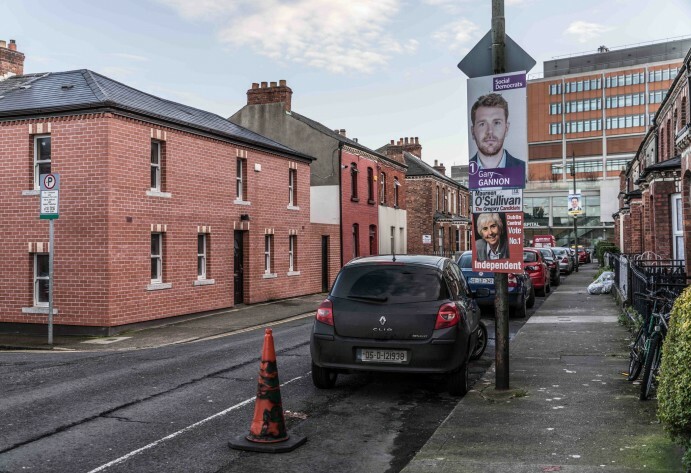 In most cases though voters in Ireland have a chance to vent their spleen prior to the elections with actual candidates, as personal door to door canvasses and local ‘walkabouts’ are a core part of every campaign. 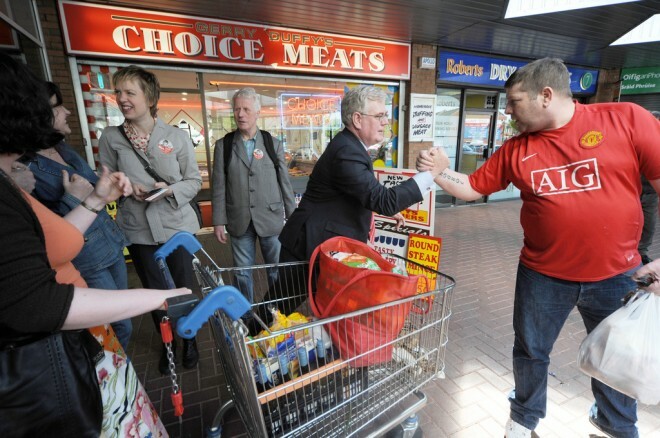 However voters even when angry or opinionated in private tend to be quite polite when actually faced with a canvasser or a candidate, and readily promise their first preference vote to everyone. In one election a voter who did this followed through on these pledges, entering the number 1 beside every candidate on the ballot paper, then at the bottom adding the note: “As promised”! There is a special breed of person who comes into view only on the day of an election count – the Tallyman (who may very well be a woman). These people arrive at the count as soon as it begins, and carefully watch the votes as they are opened, clipboard in hand. They keep a tally of where each vote goes in both first and lower preferences, estimating what that will mean for the eventual outcome. This is no small task and there tends to be at least some cooperation across party lines in coming up with a guesstimate. News outlets value the tallymen highly and seek and report tally figures in the hours while they wait for final results. They are even more valued by candidates, since they provide an early warning of what lies ahead, for good or bad. 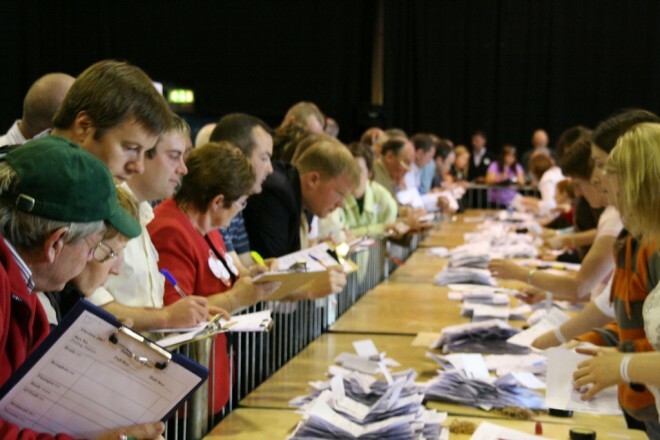 In a spectacularly badly handled attempt to move to electronic voting and counting, a trial of voting by computer was held in one constituency in the 2007 election. The tallymen had no role. A ballot which was was previously counted painstakingly by hand over hours or even days could now be dealt with in minutes. It was a disaster. Partly this was because people had little faith in the integrity of the system (with good reason). The politicians were even more unimpressed as some shocked defeated candidates received unexpected and unwelcome news with no warning at all. But perhaps the real reason the project was abandoned was that it took all the fun out of the count. Because watching the story unfold as the votes are counted and recounted really is fun. Very helpful and clear article….. Delighted to have read your article on proportional representation at this stage and prior to Friday. I had a fair idea of the system, new it was quite difficult to work out, but am now delighted to have read your article. It will make Friday’s outcome all the more enjoyable to watch and thanks for your very good help on this topic. Shall look to your site in future as a definite good reference site.